Be the first to share your favorite memory, photo or story of Vicki. This memorial page is dedicated for family, friends and future generations to celebrate the life of their loved one. 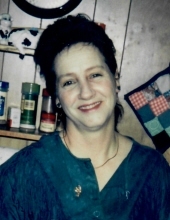 Vicki Joy Williamson-Roby, age 67, of Knox, passed away peacefully at her home on Friday, March 22, 2019. Vicki was born August 29, 1951 in Valparaiso, Indiana to Hilmer and Dora Lee Fitzgerald Sabinske, both deceased. She had been a member of the Knox Moose Lodge and the American Legion in North Judson, and had worked as a server at the Knox Pizza Hut. She is survived by her daughters, Tina Morgan of Winamac and Susan Beyor of Knox, two sisters, Sandy Rogers of Laporte and Mary Thompson of Knox, a brother, Billy Sabinske of Tennessee, and six grandchildren, Monika Guertin, Jared Morgan, Jacob Morgan, Dakota Morgan, Katie Beyor and Ethan Beyor, and twelve great grandchildren. She was preceded in death by two husbands, Robert Roby and Dave Williamson, a son, Larry Burt, and brothers and sisters, Mike Sabinske, Susan Thorson, Hilmer “Junior” Sabinske, Laura Morgan, Charles Sabinske and Ronnie Sabinske. Arrangements for a memorial service are pending. To send flowers or a remembrance gift to the family of Vicki Joy Williamson-Roby, please visit our Tribute Store. "Email Address" would like to share the life celebration of Vicki Joy Williamson-Roby. Click on the "link" to go to share a favorite memory or leave a condolence message for the family.